In my old post "Preferences and SharedPreferences" describe how to implement PreferenceActivity calling deprecated addPreferencesFromResource() method. PreferenceActivity is the base class for an activity to show a hierarchy of preferences to the user. Prior to HONEYCOMB this class only allowed the display of a single set of preference; this functionality should now be found in the new PreferenceFragment class. It's a example of using PreferenceFragment. 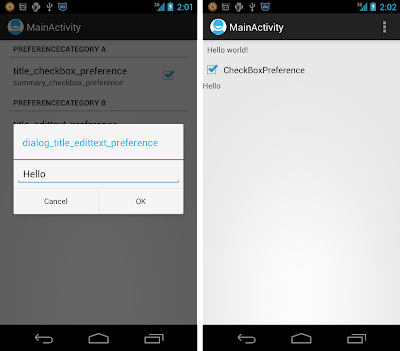 New a Android Application Project, AndroidPreferenceFragment, with Build SDK target Android 4.1 (API 16) and Minimum Required Android 3.0 (API 11), BlankActivity with Navigation Type of None. Create /res/xml/preferences.xml to define our preferences. Create PrefsFragment.java extends PreferenceFragment to addPreferencesFromResource. Create SetPreferenceActivity.java to load PrefsFragment. Modify the main layout, /res/layout/activity_main.xml, to show the preference. * Because it's onlt ONE option in the menu. * To make it simple, always re-load Preference setting. 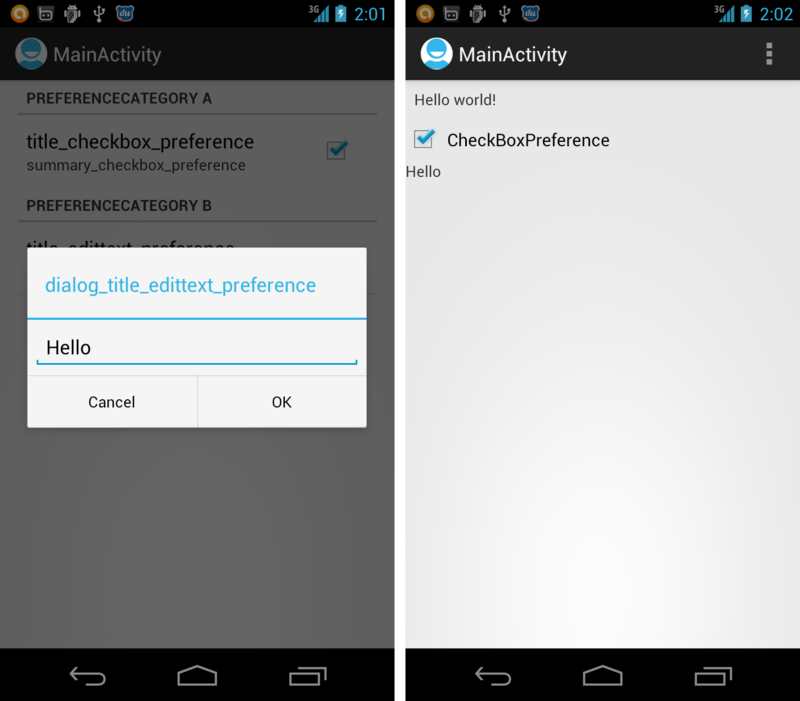 Finally, modify AndroidManifest.xml to add SetPreferenceActivity. OH MY GOD Thank you!!!!!!! I forgot I needed to modify the manifest lol. Very good it works for deprecated method addpreferencesfromresource at API 11. If you would like to change a preference summary you would need to handle that preference somehow. The method findpreference() is deprecated and ever returns null in fragment preference, so, how do you do to change the preference summary? As my understanding, what deprecated is PreferenceActivity. That means you still can use findPreference() of PreferenceFragment. I get an error under "R.id.content"
I am wondering what am i suppose to replace "content"
what is the R.id.content pointing to? I've been struggling with this problem for hours and hours where just replacing the fragments left the preferences fragment background as transparent and it would overlay on top of other content. This fixed that for me, so thanks!! content cannont be resolved or is not field in "R.id.content"
How to resolve situation when we have several of these PReferenceCategories with 2-3 preferencies..? When we add all of this fragments to the Activity Layout some of them will not be visible because they are out of screen. LinearLayout wrapped in a ScrollView makes just more troubles.. Any hints? OHHH!!! GOD!! Thank youuu sooo muchhhh this is exactly what I was searching for Thank youu ToT ! !